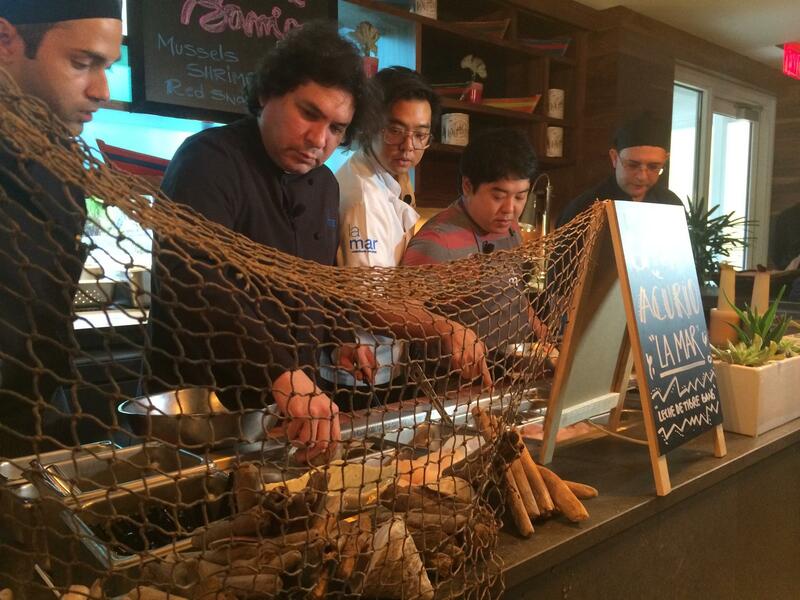 Chef Gaston Acurio, second from left, and his Leche de Tigre Gang prepare seafood dishes at La Mar at the Mandarin Oriental. Superstar chef Gastón Acurio is a trend-setter. For the past four years, Astrid y Gastón, his flagship restaurant in Lima, Peru, has made the San Pellegrino World’s 50 Best Restaurants list. His fusion of traditional Peruvian foods and French cooking techniques has earned him fame on gastronomy’s global stage. And it’s helped put Peruvian cuisine on the map, especially in South Florida. 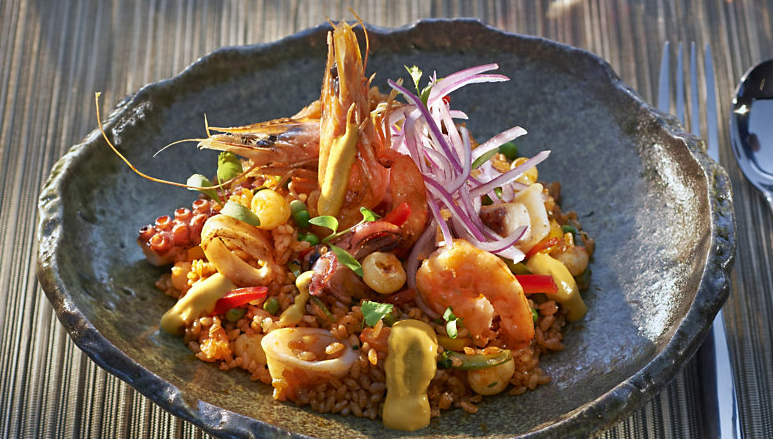 In this year’s report of top culinary trends, the U.S. National Restaurant Association ranked Peruvian cuisine as positively hot among restaurateurs. Especially popular is its staple, the Andean grain called quinoa. Quinoa, in fact, was considered sacred by the ancient Incas. Its modern revival is part of a larger rediscovery of -- and a newfound admiration for -- Peru’s ancient, indigenous roots. For the simple fact of being peruano. From food to fashion, music to architecture, enterprising Peruvians like Acurio are taking this fascination full-swing. That’s true both at home and in ex-pat communities like Miami. Acurio recently opened his first Florida restaurant, La Mar, at Miami’s Mandarin Oriental Hotel. Arroz con mariscos at La Mar by Gaston Acurio at the Mandarin Oriental Hotel. “You forget that we have 7,000 years’ history of heritage and culture and design in architecture, in everything,” Acurio says. At this year’s Miami Fashion Week, an Inca-inspired Peruvian designer named Chiara Machiavello captivated the crowds. And in cities as far-flung as New York and San Francisco, spiritual groups have invited a Peruvian therapist named Elba Bravo to conduct workshops. Speaking by phone from Lima, Bravo said her aim is to help people get in touch with their Andean souls. That memory, however, was all but cut off in the late 20th Century. In the 1980s and '90s, Peru was terrorized by the Maoist guerrillas of the Shining Path. Because they claimed to represent indigenous peasants, Peru’s Inca heritage lost much of its luster. That and the dark criminal scandals of Alberto Fujimori -- Peru’s former president, who's now imprisoned -- made that a time when Peruvians could not embrace their identity, according to Acurio. Listen to the audio version of this story, including extended quotes and some music. But those days are past, and the Peruvian, Andean, Inca ethnicity is cool again -- bacan​ in Peruvian Spanish. That’s especially true now that Peru is one of Latin America’s economic powerhouses -- Miami’s trade with the country has doubled since 2010. Elba Bravo, the therapist, says this generation is also less racist -- and that more indigenous Peruvians today are part of the middle class. Peru’s return-to-roots movement has become so much a part of life there, it’s received one of the highest compliments: satire. 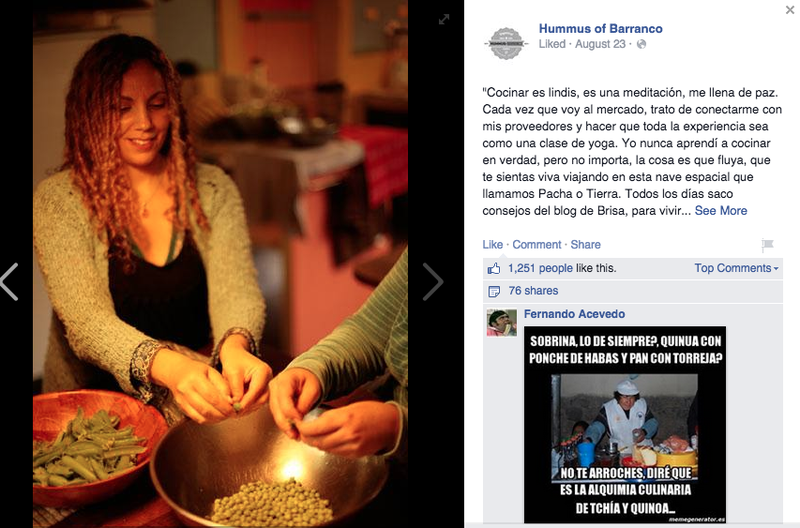 A Lima-based Facebook page called Hummus of Barranco pokes fun at trendy Lima hipsters and posts photos of them. One is a dread-headed young white woman peeling an Andean bean. “I don’t know to cook,” the fake caption says. “But I’m traveling on the spaceship Pacha” -- the Inca word for Mother Earth. And food is at the heart of the craze. Award-winning Peruvian chef Javier Florez and his wife Marita Astete run the Miami restaurant chain Aromas del Peru. Florez turns traditional Peruvian dishes into his own cuisine -- like his passionfruit version of the seafood cocktail called ceviche. But he says what matters most is that it’s Peruvian. And being proud of that again is the best trend there is. Mango? How about Key lime? If you want this year's Thanksgiving Day table to include the tastes and aromas that practically scream "Florida," which would you choose? NY Times Food Editor Sam Sifton and his team wanted to see how Thanksgiving dishes varied from state to state across the country. Gourmet waffles, spiced Cuban coffee and Miami tech are free every Wednesday in Wynwood where free breakfast is served alongside startup pitches and presentations. The event is hosted by Live Ninja, a locally based video chat company that has raised over $1 million in venture capital and secured sponsorship for this series of breakfasts from the Knight Foundation. EcoTech Visions is tucked away in a nondescript mall between the busy Northwest Seventh Avenue corridor and I-95. Pandwe Gibson, founder of the shared space for green manufacturers, is directing workers on last minute preparations for EcoTech's Nov. 20 grand opening. In this space, eco-friendly entrepreneurs -- or eco-preneurs -- will grow and expand their businesses. They will collaborate where possible and create jobs for the surrounding community.